Region: The Apple Sawfly is most commonly found in eastern United States, but there are similar species found throughout North America. Life cycle: This sawfly hibernates in cocoons within the soil and produces one brood each year. 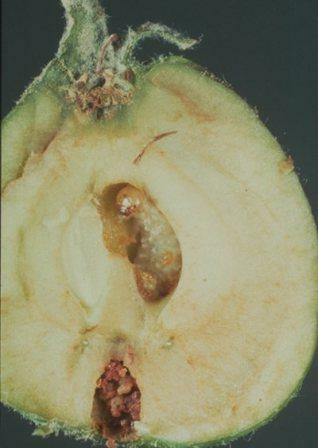 Feeding characteristics: The sawfly larvae attacks apples mining through the fruit, leaving a trail of dry material, or sawdust, on the surface of the fruit. Physical characteristics: This sawfly is about 1/5 inches long and is a yellowish brown with a black spot found on the head. The larva varies from white to tan and have a dark brown head. The eggs tend to be a shiny white and can be found on the apple blossoms. Controls: The Spined Soldier Bug will feed on the larvae. If the sawfly becomes a serious problem that could jeopardize a crop, then spray the trees with rotenone or ryania when the first leaves begin to fall. For fruit that has fallen from the tree, either discard or destroy the larvae prior to adding it to your compost pile by placing it in a sealed plastic bag and place in a sunny location for a few days.